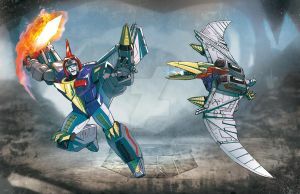 Models based on the characters from Transformers: Robots in Disguise (2001). Optimus Prime riding Sky-Byte! Riding a flying robotic shark seems more practical than riding a robotic dinosaur. Sky-byte. . . . My fav pred! RID Prime riding Robo-Jaws. Your argument is invalid!